Some missed the details in the sky last time, and I totally agree them - so I wanted to post a frame from that series that is better on this aspect. Shot at the same location, same time as the previous post: but at this frame the cam was turned more to north, the lights were different this way and I tried to use pp in an other way as well to show sky better. I hope you like this one, although it might be more common than my previous post. very well composed, i miissed them i think! two 2 trees stands up on the rightplaces and the areas are good with the different colors. A lovely composition - I like the contrast between the geometric blocks of colour and the clouds. A truly beautiful shot. I too, like the contrasts in the fields and you have captured a perfect cloudy sky to complement this one. Great work! I've added this shot to my favs, Andor.. 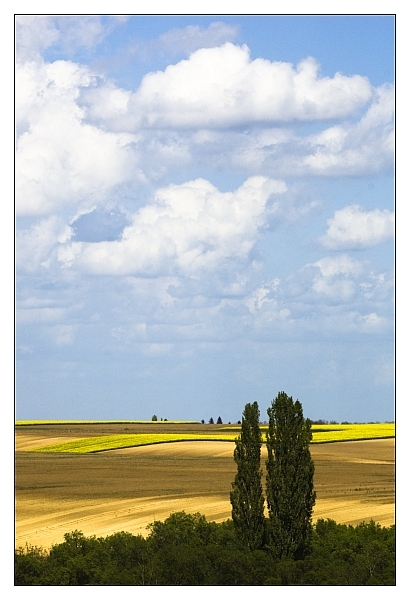 The composition is eye-catching, where the two trees in front make a fine contrast with the fields behind! Nagyon j� kompoz�ci�, kitűnően mutatja be az alf�ldi jellegű t�jat: el�l f�k-bokrok, m�g�tte a sz�nt�f�ld, a felhőzet pedig megkap�. Remek j�t�k f�nyekkel-�rnyakkal, az expoidő remek�l el lett tal�lva (k�r, hogy az exif infot nem t�lt�tted fel), nem �gtek bele a feh�r felhők, a f�nyerő-k�l�nbs�get pedig tan�tani val� m�don hidaltad �t. :) Lehet, hogy mint kompoz�ci�, egyszerűnek tartod, de olyan esetekben, ahol erre van sz�ks�g, minek t�lspir�zni a dolgokat? Beautiful landscape with the good use of rule of third to have the clouds formation well shown! I don't believe it is more common, it's just different. The former posting was different because of its panoramic presentation. It gave the impression of a wide landscape. Here, we are much more involved with details and the lighting of the sky with thr clouds is superb. I'm happy to see that your postprocessing turned out very well. The quality of a camera and a lense is one thing, the human eye and brain another one! You have made a wonderful series and presented pictures with great sensitivity. A beautiful capture with lovely use of light and shadows. The vertical look works well here,and the colours are vivid. i�m without words... i can�t belive such kind of colours!!! look at that yellow! amazing. Great DOF and POV. Lovely sky, with a great depth. Those trees gives a great toucht to the picture. The trees and shadows on the fields make together the 3D effect. Mucha luz y buena profundidad,m�s excelente...saludos. I make for this wonderful shot a workshop.